My goal with this web site is to give you the tools, tips and tricks you need to improve your audio track production. Whether you produce online video, audio podcasts, or video podcasts improving your audio is the best – and most cost effective – way to improve your production value. 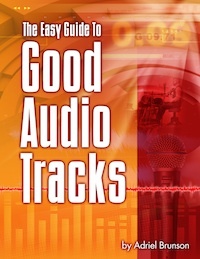 The best place to start is with The Easy Guide to Good Audio Tracks. ​There's no cost and no email required. If you have audio production questions, go to Questions. Fill out the form and I'll go my best to find answers. If you like what you see here and want to stay updated, go to Subscribe. (Or use the form at the bottom of this page.) I promise I won't share your email with anyone. Leave a comment on any post. Click on Topics and Categories to explore the posts in this site. And check out the Related Posts at the end of every page. Thank you for stopping by. I look forward to hearing your good audio tracks!